Channel 4, deltatre and 13strides win Digital Creativity BAFTA for coverage of London 2012 Paralympic Games. At a ceremony held on April 28, 2013 in London, UK, the British Academy of Film and Television Arts presented the esteemed BAFTA award for Digital Creativity to C4’s coverage of the London 2012 Paralympics Games. The award honors the collaborative achievement of deltatre, C4 and 13strides for their innovative work on Channel 4’s multiplatform coverage of the London 2012 Paralympic. Grace Dent presented the award to deltatre’s Steve Boulton and Channel’s 4‘s James Rutherford at The Brewery. By creating a full digital presence including a video rich website and social media campaign for the most unique sporting event on the planet and committing an unprecedented 150 hours of live coverage of the London 2012 Paralympics, Channel 4 earned the coveted BAFTA accolades. The dedicated C4 web site, apps for smartphone and tablet, real-time social media, and innovative video player and unique stats, were all major parts of the game-changing Digital Creativity that made the winning difference over their terrific BAFTA competition. The digital strategy James and Steve visualized, implemented and executed involved a combination of old-school journalism, ground-breaking innovation, an engaging presence on social media and an unrivalled enthusiasm for Paralympic sport by providing the most digitally advanced service of any international broadcaster. The London Games broke all sorts of records, not just on television but on its various digital platforms – website, mobile/tablet apps and on social media. BAFTA award voters were probably swayed by the powerful presentations of Paralympians as elite sportsmen and women, just like fans were that viewed the Games on TV or with a second screen across the UK and globe. C4 shared unique stories in a respectful and insightful manner. Changing perceptions of disability in the UK and beyond via the Channel 4’s digital Games was a victory for participants, fans and sportsbiz sponsors alike. In addition to celebrating deltatre’s role in the design, development and hosting across C4’s website, smartphone Apps and tablet Apps, the award also reflects the sports technology firm’s growing footprint providing engaging content as part of its full service, multi-dimensional sports coverage. This unique end-to-end approach allowed ground breaking workflows across TV and online that helped achieve new traffic records on Channel4.com and the channel’s mobile platform. The day’s editorial agenda was often set online using a combination of social media journalism and audience interaction. deltatre also provided all of C4’s on-screen TV social media – including athlete and audience tweets, polls, photos and trending information. Come Games-time, @C4Paralympics had more than 120,000 followers, the most followed Paralympic account on Twitter. They nurtured that following by making Twitter an integral part of their live transmissions, producing polls to engage the audience directly before visualizing the results graphically on screen, as well as following the top trending Paralympians to feed into the social narrative of the TV output. As well as Twitter and Facebook, they used YouTube as a testing ground to discover new disabled on-air presenters and reporters, using the website to give them exposure as they covered disability sport in the build-up to 2012. The project developed two new Sports Techie presenters for Channel 4 in Daraine Mulvihill and Arthur Williams, plus a team of talented new reporters, their careers launched by the 2012 Games. And then there was THAT Paralympic trailer, earning over 1.5 million views on YouTube along with an unprecedented social media buzz and bringing Public Enemy back into the mainstream. 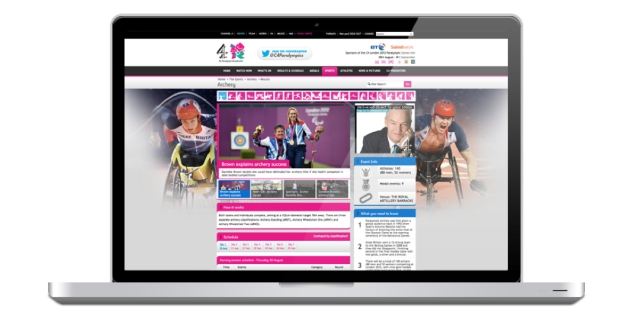 Many of these website features were replicated on mobile and tablet platforms with the C4Paralympics app, which was downloaded over 250,000 times on Apple and Android forms and registered 6.7m page impressions during the Games. Among the most successful – and complex operations – was the final-day men’s and women’s marathon, a race not covered by the host broadcasters OBS. However, despite the lack of images, the digital team found an innovative way to cover the race for broadcast on TV and online, culminating in David Weir winning his fourth gold medal. a multi-platform Optical Tracking solution for Wheelchair Rugby & Basketball, capable of detecting live impact speeds; “the Impactometer” – plotted wheelchair athletes in basketball and rugby, with infographics of everything from impact speeds to heatmaps, scoring areas to distances travelled being uploaded in real-time to the website and published into social media. three additional commentated TV channels for Sky, Virgin, Freesat and Freeview; Every one of Great Britain’s 22 gold medals that was available was shown live on Channel 4 Paralympics Extra on Sky, Virgin and Freesat, reaching 4.8m unique viewers, complemented by their cutting-edge online video player, where all four live streams were broadcast at once via the unique Quad Split function. deltatre’s ground breaking Diva video player whose unique quad-split functionality allowed viewers to watch all four of C4’s simultaneous video streams at the same time, with the ability to switch between audio feeds. There is a way to make sport events come to life for audiences everywhere. Using innovative technology, creativity and total commitment, the people at deltatre do exactly that. With staff in Torino, London, Manchester, Lausanne, Paris, New York and Portland, deltatre has over 26 years’ experience at the highest level of international sport. Always striving for the next level of interaction, we consider the future of global sport engagement to be multi-platform and social. Today, the greatest sport events on earth are more immersive, collaborative, and inclusive thanks to our cutting edge technologies. Sport fans become an active part of the event, connecting socially and sharing their passion, wherever they are. By harnessing our experience, technical skills and passion for sport, we are always one step ahead. Sports Techie, It is an honor to blog about deltatre sports technology again. 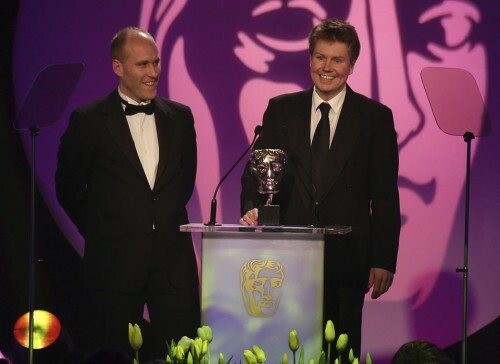 Congratulations to deltatre, C4 and 13strides for having the sports business chemistry required to win the 2013 BAFTA Television Craft | Digital Creativity award. Deltatre and C4’s innovative work on Channel 4’s multiplatform coverage of the London 2012 Paralympic was accomplished with 13strides proving visual design, Twofour producing all the athlete video diaries over a course of two years, and Livewire Sports assisting with editorial. Like Steve said, we may not be living in an age when the complete convergence of TV, mobile devices and Internet are synched together in seamless delivery, but it is getting closer and closer. By showcasing Paralympian athletes with the robust C4 platform, the world was better able to understand the will of Paralympians via unprecedented technological tools. I want to note in this blog that there was an obvious lack of mention of Oscar Pistorius and his prosthetic legs. He was the first Paralympian to ever compete at the Olympic Games and it happened during London 2012. That fact will always be. Oscar has been charged by South African police with the murder of his wife of which he has pleaded non-guilty. Whatever the trails verdict, we all know it was a tragic outcome and hopefully, justice will somehow prevail for both families. Whether he is guilty or not, Oscar was a record-breaking 2012 Olympic and Paralympic Games athlete and for that I wanted to give him his proper due, just like C4, deltatre and 13strides got from the BAFTA. Happy belated 80th birthday wishes to Steve’s Sports Techie Mother. nourishment in addition to kiwi cool cures. Basically the most productive juice machines available in the market. and with no in the long run oneself in the.